An outbreak of necrotising fasciitis in racing greyhounds in Darwin occurred over a five-day period in October. 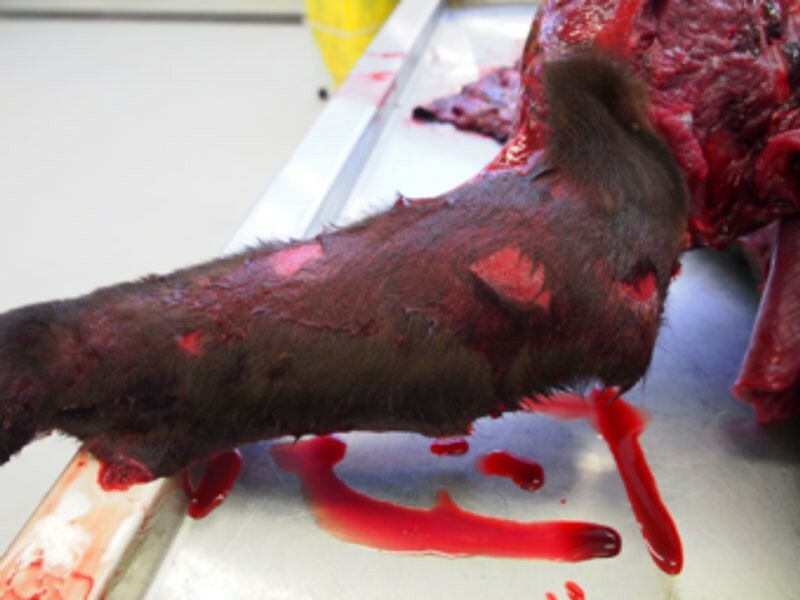 Four dogs presented to veterinary clinics with signs of lethargy, depression, elevated temperature, lameness and localised swelling of the forelimb or hindlimb, and intense pain disproportionate to the wound. Each infection started with a small skin lesion and progressed to a large area of necrosis (dead cells) and ulceration within a few hours. Another case presented in Darwin in November. In all cases, affected dogs were euthanased and testing was conducted by Berrimah Veterinary Laboratories. With varying levels of severity, further examination showed haemorrhage, oedema (swelling) and necrosis of the limbs, ecchymotic haemorrhage of lymph nodes and generalised congestion of tissues. Four greyhounds were diagnosed with severe necrohaemorrhagic fasciitis and one with streptococcal toxic shock syndrome. Death was reported to occur in another five greyhounds in Darwin without veterinary investigation. Necrotising fasciitis is a rare disease in dogs caused by S. canis. The condition appears suddenly and progresses rapidly, leading to systemic illness, toxic shock and death if left untreated. It destroys the skin, fat and underlying muscle tissues. It may present in the form of pneumonia. S. canis is considered normal flora in dogs. The change to an aggressive pathogenic type that is invasive is poorly understood, but may be due to acquired virulence factors in a particular clone. Bacteria usually enters through the skin and can be spread by contact with infected dogs or exposure in a contaminated environment. Stress associated with travelling long distances may decrease an animal’s resistance to the disease. Veterinary officers from the Department of Primary Industry and Resources inspected the kennels at the site and provided advice on biosecurity and disease control to dog owners, trainers and veterinarians. Two greyhound race meetings and one trial were suspended during this time to reassess biosecurity measures. Races resumed one week after the last case was reported in October.